Textile pests are insects, whose larvae feed on various textile fibres and which may, therefore, damage the textiles. Some of these pests also live in the wild, and, therefore, they may be accidentally carried indoors. Pests may also be carried into the apartment in textiles and furniture. In particular, second-hand clothing and fixtures should be washed or treated with a pesticide, if pests are suspected to live in them. Insect pests may also reside in the structures of buildings, if there is suitable nutrition for them (for example, the organic insulation materials used in old buildings). Pests are quite common and you should not be alarmed by them. Pests do not usually carry any diseases. An occurrence of textile pests is not dependent on the cleanliness of the apartment, but it is easier for them to habit and reproduce in untidy households. In particular, clothes storages that are not touched for a long time provide them with a suitable habitat. 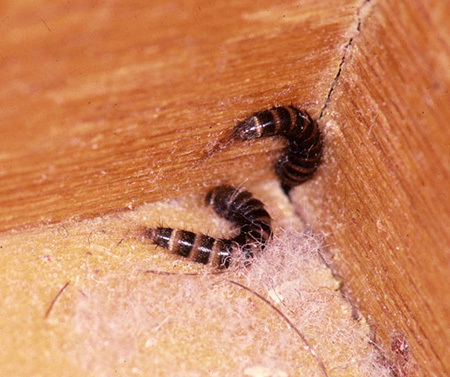 If you see these pests, it is best to inspect all cloth storing spaces. If the textiles have marks of pest activity (holes, cocoon shells of the larvae etc. ), pesticide should be applied. The storage space should be emptied, cleaned and treated with the pesticide. The pesticide should also be sprayed on baseboards, feed-through conduits of radiators, ventilation valves and similar spots, behind which the pests may be hiding or through which pests living in the building’s structures may access the apartment. After vacuum cleaning the area, remember to change the dust bag. You can exterminate the insects, their larvae and eggs by washing the clothes in + 60 °C water, by freezing them (for a week in a temperature of, at least, -20 °C) or by applying a pesticide that is suitable for the cloth in question. When using pesticides, remember to adhere to the instructions given by the manufacturer/importer. You can carry out the extermination by yourself. Please remember to not use too much pesticide, as it will not become any more effective and some solutions may leave yellow stains behind. Some of the pesticides have a long-term effect, so you should leave them on the surfaces for as long as they are effective. When using professional companies, follow the instructions given by them.